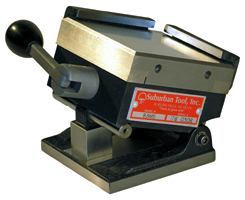 MAGNA-SINE MAGNETIC SINE PLATES by Suburban Tool, Inc.
MAGNA-SINE™ permanent magnetic sine plates are equipped with extremely powerful ceramic magnet chucks. Having stationary magnets in the top plate and a movable magnet core, these chucks provide an average holding power of up to 100 pounds per square inch. This is nearly twice the holding power of a standard chuck! The chucks provide maximum holding of both small & large parts due to a combination fine / standard pole spacing. All but the chuck is made of steel, hardened to Rc 58-60. 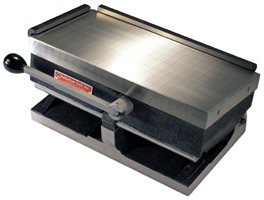 The swivel block provides full face contact with gage blocks keeping them securely in place. 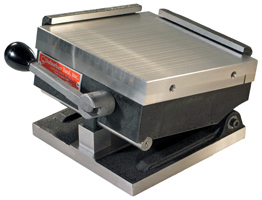 The gage block & hinge rolls are ground and lapped for straightness and roundness. An exclusive locking device inside the hinge roll provides a positive lock with an expanding action. Both screws lock toward the front of the unit, pulling the top plate down on the set-up gage blocks without distortion. The angular accuracy is guaranteed to be within 5 seconds of arc up to 15°, 10 seconds up to 30° and 15 seconds up to 45°. Side and back rails are included.